Hi, sorry if this is already posted and answered somewhere, but search here and in google isn't finding me the answer. I recently got Push (so badass!) and have found that I can dump maschine into a drum rack, set receive to "all", and Group A is then step sequence-able from Push. Cool, cool! However, if I then want to use another soundset on Group B . . . I'm lost. Thought maybe one external instrument per pad might work, similar to how you set up Maschine in Live with MIDI tracks and such, but then you're not able to utilize pads 1-16 it seems. At least not as they would be utilized in Maschine. E.g. you'd get the kick drum from A, but the note "C" from Pad2/Group B, another note "C" from Pad3/GroupC, etc. Re: Maschine in Drum Racks? it's a production mystery, eh? I think the problem is that Live only uses Midi Channel 1 on output. Hmmm, haven't had a chance to play with it much more since I last posted, but that's an experimental road to head down, thanks! After some (LOTS) of mucking about, here's what I've found - which not so coincidentally ties into using Maschine/Ableton together . . .
For what it's worth, I've set this as my default template in Live as well. Also, it's still in progress as I've found a few bugaboos I'd like to personally fix. Create 8 Midi Tracks, name them Maschine A, Maschine B, Maschine C, etc;, The letter is to reference the Maschine group. Select all 8 tracks and group them. Name the group "Maschine". Put Maschine on "Maschine A" and right click and "Group to Drum Rack". Name the drum rack "Maschine Rack"
Set Maschine receive in drum rack to All. Add Ext Inst to B, C, D, Etc. Set each Ext Inst as "MIDI To: Maschine A and then the associated Maschine output - for example doing this under Maschine B, the 2nd piece should read "2 - Maschine". Do the same for C (would be "midi to: Maschine A and 3 - Maschine), and D, and how many other Maschine groups you plan on using. Click on each group starting with B, click the Group button in Maschine and then the Out button. Set the Main out to the associated channel. E.g. B wold be 2, C would be 3, D would be 4, etc. Next, while on the same group, right-click the first sound and go to "sound midi settings". Click Enable and change the MIDI channel to the correct number Live needs. ex: Group B is Maschine B in Live, it's also track 2, so change the MIDI channel to "2". 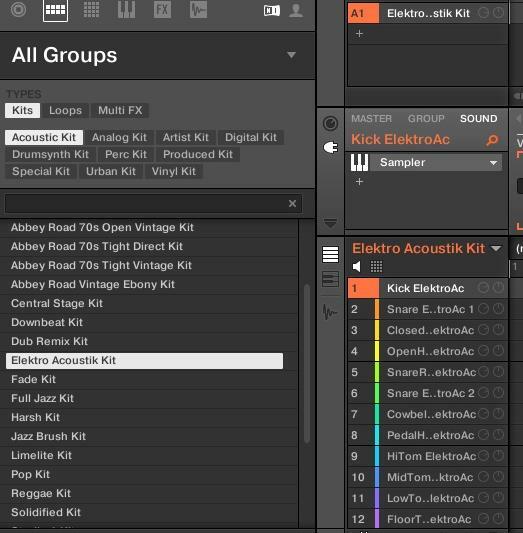 If you want to add another drum kit to a Group other than A, let's use B as an example, right-click the Group in Maschine, click Sound MIDI Batch Setup, select Sounds to MIDI Notes and change the MIDI Channel. In this case, since it's B, and accounting for the above, you'd want to set the MIDI Channel to 2. If for some reason you just want to play the first pad of the Maschine kit/group as a scale, don't add a drum rack. If you want all of the pads to be addressed in Live though, (and note this is said with using Push in mind), right click your Ext Inst in B and "Group to Drum Rack". BOOM, new kit step-sequencable in Live/PUSH. Last edited by TekMonki on Sun Jul 07, 2013 7:37 pm, edited 1 time in total. Figured out how to do multiple drum kits using Push, Maschine, and Live. Notes updated above (last item). I can't wait to try this later! I gave this a shot and what I'm getting after loading a drumset into Group A in Maschine is the same sample triggered at different pitches. supahd wrote: I gave this a shot and what I'm getting after loading a drumset into Group A in Maschine is the same sample triggered at different pitches. Check your Sound MIDI Batch Setup and such in Maschine. That messes with my head still sometimes, but is typically the issue when things seem wonky. For me I just try all three options in there til I get what I'm after. TekMonki wrote: After some (LOTS) of mucking about, here's what I've found - which not so coincidentally ties into using Maschine/Ableton together . . .
Can you possibly upload your template? If you check out the blend.io article, they have a link in there to a template they created based on all this. They're a little more detail oriented than me, so you'll probably have a better end result than whatever messy self-use template I could get you. Is there a way to create one drum rack to control all 8 groups in Maschine? mercury007 wrote: Is there a way to create one drum rack to control all 8 groups in Maschine? In Maschine set the 'midi group batch' settings for each group to midi ch. 1 and set the note range for each group to correspond with the notes covering all the drum rack cells. With the Maschine vst placed inside the drum rack and set to 'all notes' you should then be able to trigger the different maschine groups depending what octave you are at in the drum rack. that sounds great, has anyone already created a rack with this setup? are the encoders linked to maschine's encoders also? 2. 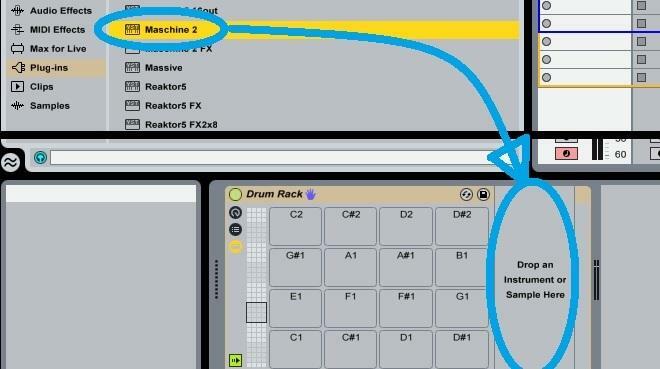 Drag "Machine 2" into "Drop Instrument or Sample here" in Drum Rack added in step 1.
a. Click the thingy in the picture.